An Israeli army commander responsible for the Al-Duheisha area, known to locals as “Captain Nidal”, has repeatedly been reported as threatening to make “all youth in the [Al-Duheisha] camp disabled”. ___BADIL, the Resource Centre for Palestinian Residency and Refugee Rights, reported an Israeli army commander making repeated threats during and after raids on the camp as well as during interrogations. MORE . . . The Israeli army’s military police have reportedly opened an investigation into the killing of an unarmed Palestinian man who was shot dead by Israeli forces on Friday, an Israeli army spokesperson told Ma’an. ___Thirty-eight-year-old Iyad Zakariya Hamed, a resident of the Ramallah area village of Silwad, was shot dead by Israeli forces near a military post at the village’s entrance not far from the illegal Israeli settlement Ofra, when soldiers alleged that they saw Hamed “charging” towards them. ___Israeli media initially reported that Hamed, a husband and father of three, fired shots at the Israeli soldiers, though it was later confirmed that he was unarmed. MORE . . .
Israeli soldiers shot, on Friday, five Palestinians with rubber-coated steel bullets, at the western entrance of Silwad town, east of the central West Bank city of Ramallah, during the funeral procession of a Palestinian who was killed by the soldiers a few hours earlier. MORE . . .
Hallward, Maia Carter. “NEGOTIATING BOUNDARIES, NARRATING CHECKPOINTS: THE CASE OF MACHSOM WATCH.” Critique: Critical Middle Eastern Studies 17.1 (2008): 21-40. Territoriality has a tendency to ‘neutralize’ the relationship between identity and geographic boundaries by classifying according to area rather than type. This means that all who live within a specific area are classified accordingly, regardless of felt identification or other personal characteristics (such as language, culture, etc.) . . . Palestinian movement between areas is regulated according to the identity card—each of which is identified with a particular geographic location—they carry, regardless of family, personal, or work-related considerations. Likewise, discussions of Jewish settlements are often framed in ‘neutral’ planning language . . . rather than noting . . . location on the West Bank, or Jewish-only population in the midst of a Palestinian Arab population, etc. Territoriality is ultimately about power and is embedded in social relations; an ‘area’ becomes a ‘territory’ only once its boundaries have been established. . . Boundaries must be maintained constantly . . . they are applied in various degrees to different people and at different times . . .
Checkpoints serve as gatekeepers; they delimit a boundary and soldiers staffing them enforce regulations regarding who can cross . . . The vast majority of checkpoints are located deep within the West Bank . . . consequently, they primarily affect Palestinians trying to conduct their daily lives. However, checkpoints also make Israeli–Palestinian interaction extremely difficult: Israeli law forbids Israeli citizens from entering areas under nominal Palestinian control . . . and it is extremely difficult for Palestinians to obtain permission to travel to Jerusalem or areas within 1948 Israel. Such restrictions amplify tendencies to stereotype the ‘Other’ as ‘Enemy’ and further solidify place (area)-based boundaries of identity. Official language used to justify the checkpoints often reflects the displacing tendency of territoriality, as it shifts focus away from the location of the checkpoints . . . as well as the relationship between the controllers and the controlled (it focuses on the regulation of who can cross and not on who has the power to make that classification). On Friday afternoon, dozens of local residents from the village of Bil’in, along with Israeli and international activists, marched toward the site of the Israeli Annexation Wall constructed on village land. They were pushed back by Israeli forces who attacked the protesters with rubber-coated steel bullets, tear gas and concussion grenades. ___According to the Popular Resistance Committee of Bil’in, this week’s protest focused on the recent desecration and attacks on holy sites by Israeli settlers and soldiers. These attacks have included armed marches by settlers and soldiers into the Al-Aqsa mosque, as well as the defacement of numerous Christian churches by Israeli assailants. ___Palestinian residents of Bil’in have been protesting every Friday for the past eleven years, and the weekly protests recently entered the 12th year. MORE . . .
asked for my real name, I told her, “Dumm,” what? -Sam Hamod is a poet who was nominated for the Pulitzer Prize in Poetry, has published 10 books of poems, the winner of the Ethnic Heritage Prize for Poetry, taught at The Writers Workshop of The U. of Iowa, Princeton, Michigan, Howard and edited THIRD WORLD NEWS in Washington, DC. He contributed this poem to PalestineChronicle.com. Contact him at: samhamod@sbcglobal.net. Israeli occupation forces murdered on Friday Palestinian citizen in West Bank city of Silwad after buying some candies for his disabled children. ___At first, the Israeli occupation forces and the Israeli parrot media claimed that his approached an Israeli military post with his car near the illegal settlement of Ofra. ___Palestinian eyewitnesses insisted that the Israeli narrative about the incident was false as the Palestinian did not plan to harm any Israelis. [. . . .] Official Palestinian medical sources identified the Palestinian as Iyad Hamed, a resident of Silwad who was married and had three disabled children. ___Later on, when a video showed the man buying the candies for his disabled children went viral on the internet, the Israeli occupation admitted that its soldiers had shot the Palestinian mistakenly. MORE . . . The United Nations Friday responded in a statement to Israel’s announcement Wednesday that the military had exonerated itself from any wrongdoing in a missile attack near an UNRWA-run school in Rafah during the 2014 Gaza war, which killed 15 people. . . . ___According to the statement released by UNRWA spokesman Chris Gunness, on August 3, 2014 . . . Israeli forces launched a missile at a road outside of an UNRWA school, which was designated as an emergency shelter for displaced Palestinians on July 18 and was at the time sheltering at least 2,900 Palestinians. ___The strike resulted in the killings of 15 civilians, while at least another 30 were injured. ___ “This raises serious questions about the conduct of military operations in relation to obligations under international humanitarian law and respect for the inviolability and sanctity of United Nations premises under international law,” Gunness said in the statement. MORE . . .
Kemp, Martin. “DEHUMANIZATION, GUILT AND LARGE GROUP DYNAMICS WITH REFERENCE TO THE WEST, ISRAEL AND THE PALESTINIANS.” British Journal of Psychotherapy 27.4 (2011): 383-405. SOURCE. Central to the defensive ends served by the denigration of the Palestinians is the avoidance of a profound depression that would follow from the acknowledgement of Israel’s responsibility for the Naqba . . . [That drives] the Israelis to dehumanize the Palestinians, [but] breaking with this necessity and embracing their humanity is a requirement for both peace and for Israel’s survival. . . . Israel’s ‘large group tent’ is in large part held together by the projection of Israel’s profound and unresolved conflicts onto the Palestinians, and that dehumanization of the latter is . . . difficult to reverse. One conclusion might be that political Zionism has not offered an escape from the dynamics of oppression, merely a reversal of roles.
. . . it could be imagined that the collective psyches of the West and Israel are each grappling with a crippling burden of culpability. I suggest this, and that each engages the other in their efforts to minimize the consequences. The West, aware of the pain that guilt would occasion for itself achieves distance by reassuring Israel – identified with the fate of ‘the Jews’ – that it has no need to feel guilty. The West has regularly upheld Israel’s position that it is the Palestinians who need to make up for something, and that it is their failure to do so that explains the protracted stalemate. For the West to concern itself with the lived experience of the Palestinians would be to challenge an Israeli psyche in part held together by its refusal to acknowledge those realities. Responding to [the] suggestion that we attend to the moment when the terrorist decides to ‘abandon their species decency’, G. Awad writes: “Less dramatic, but also lethal, is the slow and cumulative abandonment of a deeply ingrained species decency where there is no defining moment: this can be seen in the increasingly destructive actions of the Israelis against the Palestinians. A powerful oppressor can, more often than not, afford to wait things out and take his time; an occupation or an embargo can slowly yet effectively destroy the soul and the body of ‘the others’. The powerful can kill without dirtying their hands or exposing themselves to imminent danger . . . many Arabs and Muslims, even if they are horrified by the nature of the suicide bomber’s attacks on innocent civilians, do not see such attacks as being any more horrible than the slow, methodological killing of their innocents by the powerful” (Awad, G. “The minds and perceptions of ‘the others.’” 2003). Four Palestinian hunger-striking prisoners are reportedly in critical condition at Israel’s Assaf Harofeh Hospital, according to a statement released Saturday by the Palestinian Committee of Prisoners’ Affairs, as 120 other Palestinian prisoners continued hunger strikes in a mass solidarity movement. ___ each of the prisoners declared a hunger strike in protest of being placed in administrative detention — an Israeli policy of detention without charge or trial almost exclusively used against Palestinians. ___The committee said in the statement that the hunger strikers were in “dire health conditions,” as they have lost a significant amount of weight and have been suffering from pains and numbing in their bodies. MORE . . .
An Israeli judge Tuesday ordered the release of a Palestinian from the occupied East Jerusalem neighborhood of Jabal al-Mukkabir who was redetained four days after being released from a 14-year sentence in Israeli prisons, according to local sources. ___Israeli Magistrate Court’s judge ordered the release of Jerusalemite prisoner Sufian Fakhri Abdo from Israeli prison and imposed 14 days of house detention and a 10,000 shekel ($2,653) fine on him. MORE . 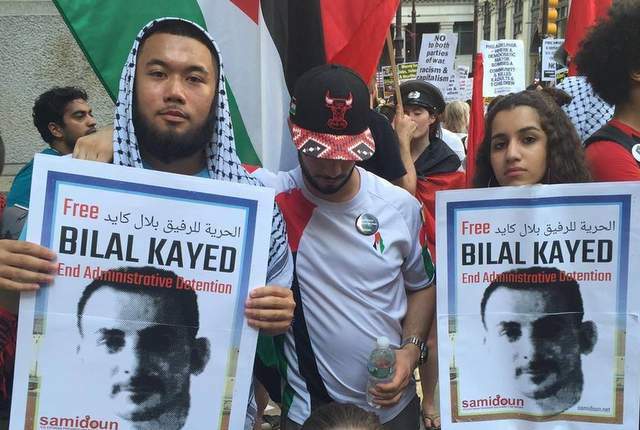 . .
___Kayid has been on hunger strike for 70 days after Israeli authorities sentenced him to administrative detention — internment without trial or charges — on the day he was scheduled to be released from prison after serving a 14-and-a-half year sentence. ___Kayid has since been hospitalized after his health severely deteriorated. However, the Israel Prison Service (IPS) has kept him shackled to his hospital bed and has had guards surrounding him at all times. MORE . . .
Israeli occupation forces (IOF) arrested on Wednesday morning seven citizens in raids to different parts of the occupied West Bank. ___Local sources said that Israeli forces raided several houses in the town of Halhul in Hebron, and arrested three citizens identified as Abed Jnazrah, Ayman al-Omran, and Ali Sarayaa. MORE . . .
Bailey, Pam. Washington Report On Middle East Affairs 33.3 (2014): 21-22. Prisoners are perhaps the most powerless individuals in the world. They are at the mercy of their captors–deprived of freedom of movement, stripped of virtually all personal resources, limited in communication with the outside to rationed, supervised moments. ___But the human spirit is not easily extinguished and, particularly when people are imprisoned for their belief in a cause, the natural leaders among them fight back with what little they have: their brains and their bodies. [. . . .] The Addameer Prisoner Support and Human Rights Association has joined the World Organization Against Torture to express concern about their health and harsh treatment, as well as call on international activists to protest to Israeli authorities. Meanwhile, the Israeli government is considering a new rule that would allow the force-feeding of hunger-striking prisoners whose lives are in danger. Israel had previously stopped the practice after three prisoners died as a result. [. . . . ] Sometimes, however, what seems like individual wins can carry larger symbolism–as in the case of Samer Issawi. Over the course of a partial hunger strike of 266 days, Issawi lost half his body weight and suffered numerous health problems–yet rejected offers to release him if he agreed to be deported someplace other than East Jerusalem. By insisting on going home, he captured the hearts of activists and caught the fickle media’s attention–and won. ___”My victory was a Palestinian victory that proves nothing is impossible in the face of our will,” he says now. “If I had to do it over again, I would, because nothing is more valuable than freedom.” FULL ARTICLE . . . .
and the comrades of my cell? we grow like the wild flowers. United Nations warned that 46 Palestinian residential areas in Central West Bank are “at risk of forcible transfer” due to increasing Israeli settlements. ___David Carden, Head OCHA oPt, delivered a speech on the occasion of the opening the school year in Khan al-Ahmar, one of the ‎Palestinian community at risk of forcible transfer in Central West Bank, and launched his warning. ___Carden delivered the speech on behalf of the UN Coordinator for Humanitarian Aid and Development Activities Robert Piper. ___“We come here today to express our solidarity with the people of Khan al-Ahmar, long identified as a community at risk of forcible transfer and with whom the international community has worked closely for many years,” he said. ___”As we know, Khan al-Ahmar is one of 46 residential areas in the Central West Bank identified as being at risk of forcible transfer due to Israeli relocation (settlement) plans,” he said. MORE . . .
___Two tenders were published to lease land for renewable 49 year contracts, while the others were for building a hotel and park near the industrial zone of the settlement, according the Israeli newspaper Kol Hair. ___The six-story hotel will reportedly be the first in the settlement, and is planned to be built over 2,300 square meters. It will also be located near the mall. MORE . . .
___A Palestinian civilian was killed while 32 others were wounded in al-Fawar refugee camp, south of Hebron. A Palestinian civilian was wounded in the eastern side of al-Bureij in the Central Gaza Strip. MORE . . .
BACKGROUND: Waxman, Dov. “Israel’s Palestinian Minority in the Two-State Solution: The Missing Dimension.” Middle East Policy 18.4 (2011): 68-82. FULL ARTICLE. Thus, if Palestinians in the territories abandon their demand for an independent state and instead demand equal rights within Israel, Palestinians in Israel could easily join them in demanding a single bi-national state within the whole territory of Israel/Palestine. As long as the occupation continues and the Palestinian minority in Israel is completely marginalized; the chance of this happening — a “nightmare scenario” for Israel — steadily increase. There are already signs of growing support for the one-state solution among Palestinians in the territories, and, although most Palestinian citizens of Israel are currently opposed to this, some prominent individuals have voiced support for it. One thing is certain: there is absolutely no way Israeli Jews will accept a one-state solution. They will staunchly resist it, even at the cost of war. Respecting the rights of all parties to the conflict — Jewish citizens of Israel, Palestinian citizens of Israel, Palestinians in the West Bank, Gaza Strip and East Jerusalem, and Palestinian refugees in the Diaspora — is the only way to eventually achieve peace and reconciliation. Grant you the gift of eyesight in my eyes. Is but my share in your larger tragedy. Nor will I ever be humbled. Carrying my blood in my palms. And have always tended the grass over my ancestors’ graves. I call upon you, and clasp your hands! ___The committee said, in a press release, that the plan aims to give Jerusalem a Jewish character, obliterate its Arab Muslim and Christian identity, deface its history and create a new face that doesn’t relate to the original Arab Jerusalem. ___Secretary General of the Committee Hanna Isaa said, according to WAFA correspondence, that the plan is proposed on around 720,000 meter square of land and would cost 1.4 billion shekels ($370 million USD). MORE . . .
Rosmer, Tilde. “Resisting ‘Israelization’: The Islamic Movement In Israel And The Realization Of Islamization, Palestinization And Arabization.” Journal Of Islamic Studies 23.3 (2012): 325-358. SOURCE. . .
[. . . .] Islamic Movement activists continuously structure their activism with the intention of preserving and reinforcing the Palestinian and Muslim identity of Muslim Palestinian citizens of Israel, despite their presence in what is now a Jewish state. Interviewees were aware of the balancing act this predicament necessitates and were willing to discuss it openly. [. . . .] The process of Israelization can be viewed from two perspectives. Measures taken by the state towards its Palestinian citizens intended to weaken their Palestinian identity and strengthen their identity as acquiescent, Hebrew-speaking ‘Israeli Arabs’, enforced through controlling their education and economic and political opportunities. Israelization is also an effect of the expected influences on Palestinian citizens’ identity, culture and lifestyle derived from living and working in Israel and the resulting exposure to, and to a degree participation in, Hebrew and Israeli media and mainstream culture. [. . . .] In common with other Islamic movements in the region, the Islamic Movement in Israel shares the approach of Islamization from below through its network of local institutions and mosques and through the emphasis it places on da’wa. The main difference between this Movement and other regional movements is due to its political context in Israel. This context has produced the paradoxical predicament wherein Palestinian citizens are able to establish and run their Islamic Movement openly and lawfully, including enjoying representation in the Knesset, as long as their activism is not perceived to threaten the Zionist identity or national goals of the state. However, members and supporters of the Islamic Movement are discriminated against as non-Jewish citizens of the Jewish state and particularly as members of an indigenous national group with which Israel remains in conflict. [. . . .] . . . the interrelated processes of Islamization, Palestinization and Arabization are responses to the processes of Israelization, which refers to the adjustments of identity and life-style and to limitations in political and social activism in accordance with their minority status. [. . . .] . . . the activism of the Islamic Movement in Israel focuses on creating local institutions that provide services the State does not provide for this constituency and promoting its Muslim, Palestinian and Arab identity. Both the goals articulated by the Islamic Movement in Israel’s leaders and its activism portray a pragmatic appreciation of the limitations of their context while simultaneously struggling to cater to the social, spiritual and communal needs of the Palestinian citizens of the Jewish State. For more than one month the Israeli Government and Occupation Authorities have planned and have worked on installing a new permanent checkpoint structure and other permanent buildings on the historic grounds of the Ibrahimi Mosque in the Old City. Their plans (as seen below) reveal vast damage will be done to the historic grounds of this cultural heritage site. The Israeli plans include remove stones from the Mosque’s site which is more than 2000 years old. These plans will permanently damage the historical Ibrahimi mosque and the aesthetic fabric of the area. MORE . . .
Israeli Defense Minister, Avigdor Lieberman, announced during a meeting with military reporters at the headquarters of the Israeli Defense Ministry in Tel Aviv yesterday, a plan to launch a 10-million shekel online channel directed at Palestinians in the West Bank. ___Lieberman said the plan would include “treating Palestinians who are ready to co-exist with Israeli settlers in the West Bank well, and imposing restrictions on those who do not.” More . . .
❷ Israel refuses to give building permits, demolishes Palestinian homes. 35 Palestinians were injured, one seriously, early Tuesday morning during clashes when Israeli forces stormed the al-Fawwar refugee camp in the southern occupied West Bank district of Hebron. ___Locals told Ma’an that large numbers of Israeli troops surrounded the camp around dawn on Tuesday, when they began ransacking homes and interrogating residents in the streets. Background: “Ongoing Exile: Palestinian Children Write Their Ongoing Nakba.” Palestine-Israel Journal Of Politics, Economics & Culture 15/16.4/1 (2008): 159-164. My Nakba separated me from my family and my land. I live in a place far from the past, but the past will be the present with my return to my homeland… the land I dream of every night. I often look at the stars in the sky and wonder why I am here… in a camp that has nothing for my present and nothing of my past. In it I live as a stranger amongst the rubble and the ruins. [. . . .] My cousin completed his studies in Sudan and worked in Saudi Arabia. He decided to leave everything to come to find us and live here as long as he could. It was here that the Israeli soldiers killed him. Perhaps it was his fate after being separated from his land and family all his life; it would be from here, after his return, that he would ascend to heaven. I am one of the children of this world; I live in a refugee camp, and I say to anyone who will listen that I am a child, and that I will be free like the other happy people living in their homes, on their land, in their country. I am a child who lives under the ruins of constant Israeli violence, the bullets and the bombs. Every day I hear that someone in our camp has been killed or injured or imprisoned. I wake up to the sound of the tanks and the sounds of the planes hovering in the skies above our houses, our homes. They search these homes; they kill and imprison children and old people; they injure and kill those who have committed no crime, and then they call us terrorists. I am a child, and I know that one day I will be free like the other happy people, but that this day will only come after I return to our real homes, the place where we can return happiness to the hearts of the children, the women, and all those who have committed no crime. Israeli occupation forces destroyed Tuesday morning eight homes and two stores in Sa’ir town east of Hebron. ___Local sources reported that the houses which were demolished are inhabited. Israeli occupation had handed the Palestinian homeowners demolition orders before two years, so they have tried to get building permits but the occupation refused to give them building permits. ___It added that a large military force raided with bulldozers Ein Aljawza town and forced the Palestinian residents to evacuate their homes in order to destroy them. MORE . . .
___“As I was growing up, I could see the settlement getting bigger. I guess you can say that we grew up together,” he says, laughing at the irony. [. . . .] In February [in Abu Nuwwar], the Israeli army demolished two trailers which were to serve as a new school for first- and second-graders. The cabins, donated by a French nongovernmental organization and funded by the European Union, bore visible EU logos. MORE . . .
[. . . .] Palestinians have taken to the streets to demonstrate against nearly 50 years of military rule and the denial of their freedom at the hands of Israel. These protests come after the death of the peace process, the election of a rightwing Israeli government that has stated it has no intention of granting Palestinians their rights, and growing discontent with the unelected Palestinian Authority (PA). ___The protests have also been fueled by repeated Israeli announcements of settlement expansion; settler attacks on Palestinian lives, property, and holy places; and the Israeli government’s decision to allow right-wing extremists who seek the destruction of the Al-Aqsa Mosque to enter the Haram al-Sharif compound while simultaneously denying Palestinians access to their holy sites. [. . . .] First, as the occupying party, Israel is required under international law to ensure the protection of the civilians under its rule. Instead, Israel has, during its 48-year occupation and colonization of Palestinian land, done exactly the opposite. ___Two Palestinian generations have grown up entirely under Israel’s military control. By 2014, more than 800,000 Palestinians had been imprisoned by Israel, including 8,000 children under the age of 18 arrested since 2000. Currently, there are 5,621 Palestinian political prisoners in Israeli jails. [. . . .] Things have reached such a pass that even PA President Mahmoud Abbas has been compelled to call on the UN “to provide international protection for the Palestinian people,” as he did in his September 30 speech to the General Assembly. MORE . . .